Bella is a fabulous pure English Cream Golden Retriever of English/French descent. Her list of Champion lines are amazing! Her and Shilo’s COI factor is very low 7.5 (considered longer an added 4 years of longevity in their pups) so you can imagine the health and vitality these pups will have. She is incredibly intelligent and absolutely beautiful. Perfect conformation and disposition. We are very excited to have her join our Team. Shilo has his National and International Champion Titles as well as has his CGC award. He is out of Canadian Champions, Kyon’s Flaming Fire and Ice from Dewmist Davenport Shilo is a proven breeder with over 400 pups on the ground. Because of his kind and intelligent nature he has been sought out for Service Dog Organizations across the country. He is available for services ranging from live cover, fresh chilled and frozen . 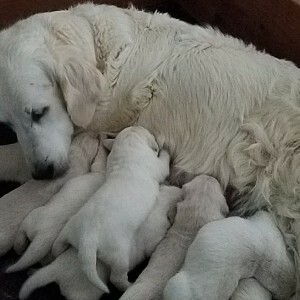 If you are looking for a beautiful English Cream Golden Retriever puppy you came to the right place. We are taking reservations for his puppies. Please view his puppy link for updates and be sure to watch his videos. He truly is "One of a Kind"
Click the Red tabs below to see Shilo on You tube! National and International Champion Titles, AKC Agility (ASCA, CPC, AKC), Rally, Obedience and Conformation. Proven Stud.